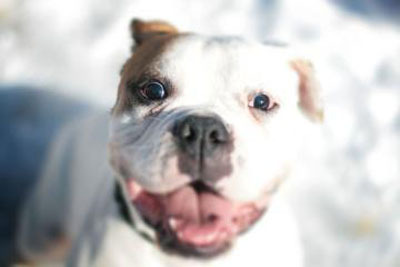 Dozer is a three-year-old male American bulldog. He was brought to Lollypop Farm as his owner no longer had time to care for him. This huggable, sweet guy tips the scales at 86 pounds. He would be happiest as your one-and-only dog (maybe, even pet) as he could then be the center of attention! He would also do best in a home without young children as he's a pretty solid guy. Dozer does well on his leash and enjoys chasing tennis balls. He doesn't see the point of bringing them back, though! Come and meet this lovebug today! Dozer is waiting for you. Searra, the cat from last week, has found a home!